Edited by Catalina Steiner, 01 May 2015 - 07:23 AM. LRM's are "long range missiles". That means that you can use missiles within a range of 180m - 1000m (IS). 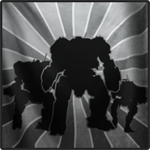 Clan mechs have no minimum range but their damage is decreasing strongly below the range of 180m. 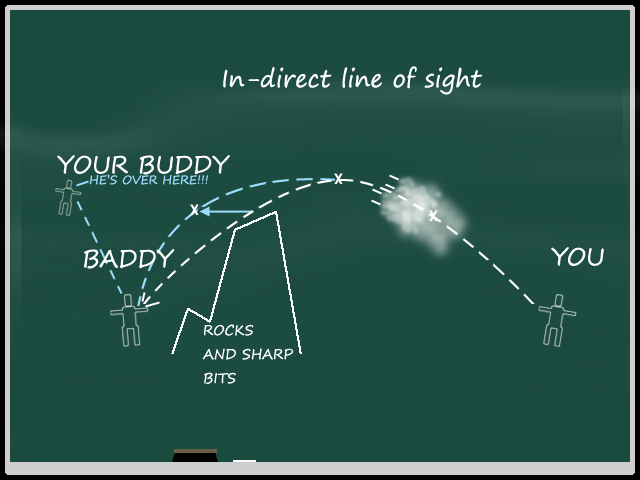 Long range missiles are the only weapon that are able to hit an enemy with "indirect fire". You don't need to see them, you don't need to have a line of sight, even if some equipment helps to increase the damage if you have a line of sight (see TAG and Artemis). You need to get a lock on the target (other friendly mechs can spot the enemy for you and you can lock them) and then you are able to fire your missiles on that target. Sounds easy but isn't it... especially if you want to be a real damage dealer. You can also watch the scenario from the view of the enemy spotter. You are a support mech. This is the hardest part to get over: you will rarely dominate a game in this role. That's the thing you have to understand - you are a SUPPORT mech: you support your team, not dominate it. What this means is that you will usually not be raking in the kills or the C-bills, but you will be helping your team win matches. Do not mix-and-match your loadouts; LRM's are the most "all in" weapon in the game. They are poor secondaries. Surely there is much more to say about LRM mechs but these two quotes tell a lot. You are a supporter - and you should focus on LRM's. Not the easiest job to do because focussing on one weapon system nearly contains the goal of dominating the match with this weapon. That's the reason for the training: to become such a good pilot to dominate matches with this mech and its weaponry. But stay modest - especially in your early days. Edited by Catalina Steiner, 02 May 2015 - 07:08 AM. Everything begins with the choice for the right mech. Actually we are able to build LRM-Mechs with light mechs, mediums are great LRM-Mechs, heavies are great LRM-Boats and some assaults are also very valuabe to build a LRM-Boat. 1) Does my mech have missile hardpoints? 2) How many missile tubes are provided by them? Not every mech has missile hardpoints but nearly all mechs own variants with missile hardpoints. There are good mechs for carrying LRM's and there are bad mechs. It has to do with the component which carries the hardpoint and the number of tubes. Every green box shows the missile hardpoints (1M: one missile hardpoint, 2M: two missile hardpoints, etc.). The number put in brackets shows the number of missile tubes in each hardpoint. (6) means six missile tubes. The green boxes are showing the place of the missile hardpoints. The Catapult owns four of them, two in both arms. Now we need to watch the missile tubes. We can read the following information: 2 M (20, 10). The Catapult provides two missile hardpoints in his arm with 20 in first launcher and 10 in the second launcher. If you want to install 2x20 LRM launchers, they won't be fired in an alpha strike (in one bundled shot) but in a short chain fire. With the first shot, 30 LRM's will be launched and the remaing 10 LRM's will follow them immediately but with a very short delay. If you want to fire an alpha strike without delay, you need to install LRM20 and LRM10 launchers or less. If you install two LRM5 launchers, you don't have any issues with the missile tubes. The biggest launcher will be always installed first (and so are the hardpoints: 20, 10). This Commando has one missile hardpoint in the center torso with 2 missile tubes. This is perfect for installing a SRM2 launcher. But you can also install a LRM5 launcher or even a LRM10 launcher! If you install a LRM5 launcher, you have three bursts of missile fire. The mech launches 2 missiles, 2 missiles and 1 missile, with a short delay. If you install a LRM10 launcher, you even have five bursts of missile fire. The mech launches 2 missiles for five times! You can also fire your LRM launchers in chain fire, you need to adjust it in the weapon group settings (HUD, right below corner). Usually you will fire your LRM's in an alpha strike (all missiles in one fire burst). But if you chose "chain fire", your launchers will be launched one after another. 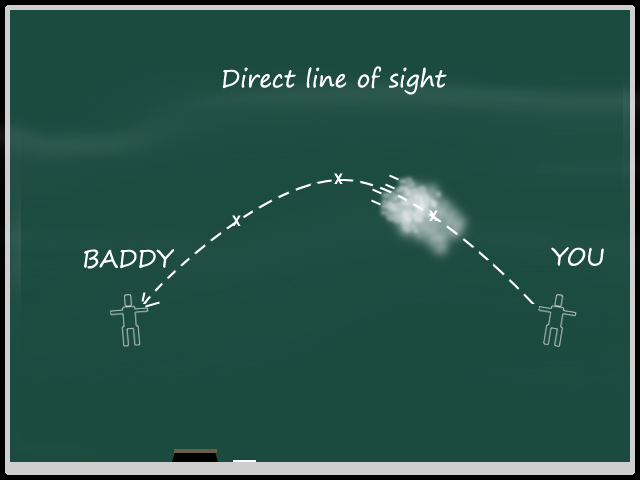 1) Missile economy: this setting comes into play if you need to go easy with your missiles. If an alpha strike does not hit with 2x LRM20 launchers, 40 missiles are gone. 2) LRM spammers: LRM spammers like my Hellcat (GRF-3M with 4x LRM5) is using this setting to harass the enemy first and foremost. Some mechs have excellent quirks for boating LRM's. Mist Lynx, Kit Fox, Adder: these chassis have some variants with a quirk that helps to bundle missiles (for example: LRM 5/10/15/20 spread: -4.00 %). Some mechs own missile doors. Before missiles are launched, the doors need to open. I have made a whole thread about this topic, please continue reading here. Edited by Catalina Steiner, 02 May 2015 - 07:17 AM. Every light mech with missile hardpoints could carry LRM's. Most of them have six or ten missile tubes (see above) available in their launchers. Panther and Raven are potential LRM support mechs. 35 tons are enough to load the equiment and the ammo you need to be a threat. But I also built LRM mechs with Commandos and Locusts, also the Jenner provides the most missile tubes in his missile hardpoints (10). Clans: Kit Fox and Adder could do the job. 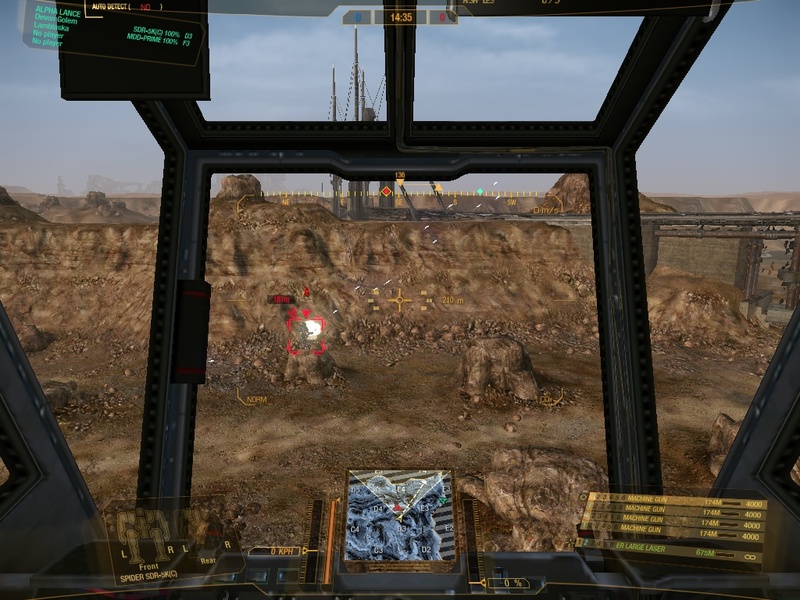 Mediums are great LRM supporters, especially on sight (direct fire with line of sight). Kintaro, Trebuchet, Griffin, Shadowhawk and also the Wolverine are very good mechs for installing LRM's (as for me in that order). They are fast and 55 tons are enough to carry lots of equiment and ammo as well. All mechs above are 55 ton mechs except the Trebuchet. The Griffin 3M is the best medium LRM mech in my opion. You can build a perfect LRM harrasser with this chassis. 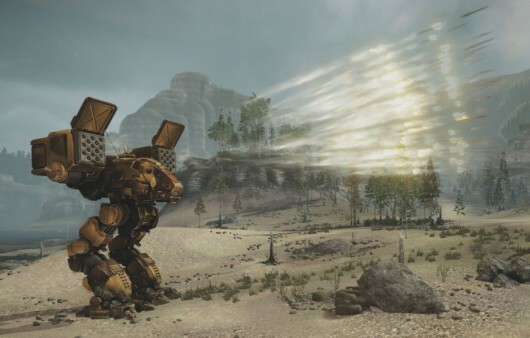 Clans: the Stormcrow can be build as dangerous LRM mech. Heavies are the classic LRM-Boats. Catapult, Orion, even the Quickdraw, the JM6-A also does a great job. 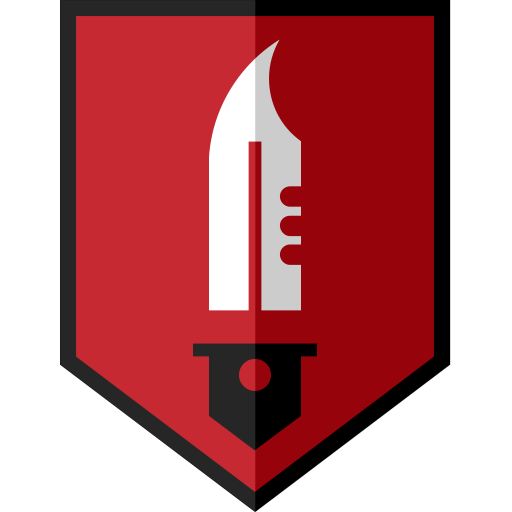 You can carry big lauchers, lots of equiment and ammo and you have no problem to install close range weapons to defend yourself against annoying lights or a surprising severe threat. Clans: Clan heavy mechs are perfect LRM boats. The Mad Dog is the ultimate LRM-Boat. The Timber Wolf is maybe the best LRM-Boat, Hellbringer and Summoner can also be used for dangerous builds. Highlander, Stalker, Battlemaster, Zeus, Awesome and Victor. All these chassis are potential LRM-Boats (as for me in that order). As for me, the Battlemaster 1S is the ultimative LRM mech. I mastered this chassis only for the reason to own the 1S as LRM-Boat. And it's set in my CW dropdeck since day one, it's the only mech I never changed. 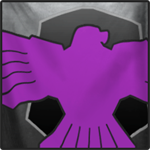 Clans: the Warhawk is doing an excellent job as LRM-Boat. Edited by Catalina Steiner, 02 May 2015 - 07:18 AM. Artemis bundles your missiles if you have a line of sight on your target. They hit in a close burst. The biggest disadvantage is the weight. Every launcher weights +1 ton. So, the question is... is it worth it? LRM5: no, the LRM5 launchers are quite accurate, not much LRM's are missing the target. And: most of the times you use LRM5, it's because you dont have much tonnage for carrying LRM. Any ton wasted with Artemis will make you relinquish necessary ammo. LRM10 maybe, but only if you dont use more than two launchers. For example, the Trebuchet with 2xLRM10#Artemis is a nice mech. Again it's about the weight. It's not worth it most of the times (also because the LRM10 is quite accurate). LRM15: yes. 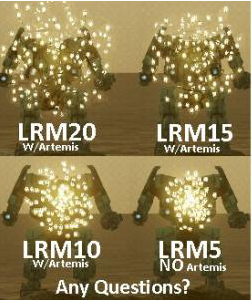 LRM15 spread a lot and mostly you use those big launchers in heavy or assault mech, what means you should have some weight left for building an LRM mech. Use it if you really want to support your team on sight. It's not classic LRM boat style but nearly a brawler. Classic LRM boats with indirect fire support do not need Artemis! TAG is needed for LRM Boats who need to get their own locks. It also works like Artemis, if you target a mech, the missiles hit the target bundled. You need to put the laser on the mech constantly for sustained TAG use. Do not use NARC as a LRM boat. But NARC is your best friend in a match. If a light uses NARC for you, your top damage is nearly guaranteed. Every LRM boat should have it, in case of emergency or a lucky spot to get locks. Lights and mediums for sure, sometimes also heavies, rarely assaults. 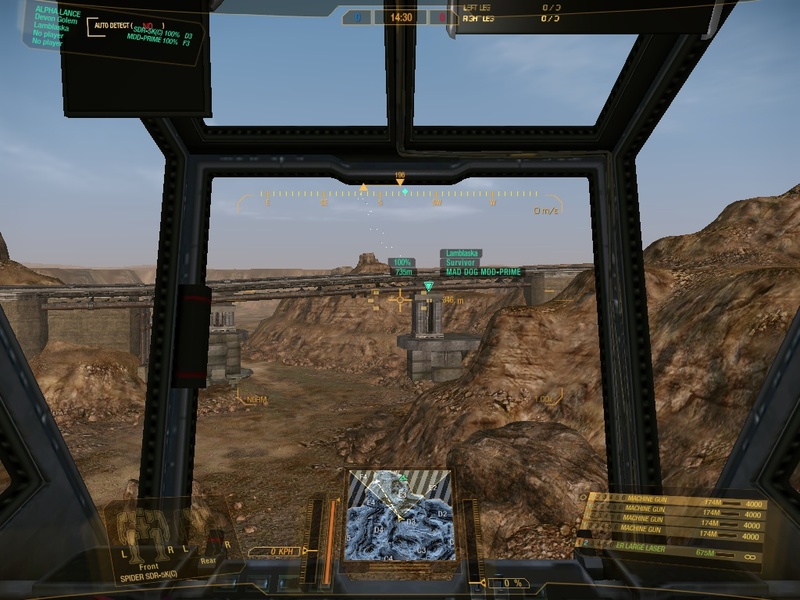 If you are a new mechwarrior, most of the HUD symbols look very cryptic. 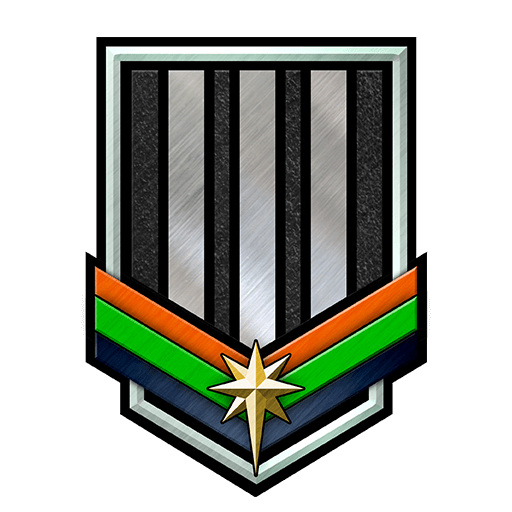 The most symbols are very important and indispensable informations about a LRM mech pilot. Edited by Catalina Steiner, 02 May 2015 - 07:03 AM. This part of the guide is the core. You need to train these skills to be a pro. Even if this part is just a list of skills right now, I will try to add more explanations and video tutorials later to show you how it works. Maybe you want to help me with that, feel free to contact me for video, picture and text material. Edited by Catalina Steiner, 29 June 2015 - 05:29 AM. Edited by Catalina Steiner, 02 May 2015 - 07:20 AM. Edited by Catalina Steiner, 25 May 2016 - 06:36 AM. Lamblaska, mech piloting in "UAV video", guinea pig in various example videos, thanks a lot! Faythofthelost: merciless destroyer in various tutorials, thanks a lot! Aphelion Dax and Cyclone Jack for helping with the tutorials as well. Thanks ORMC for support! Edited by Catalina Steiner, 22 May 2015 - 04:00 AM. 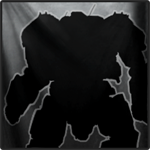 This is my new guide about LRM's, LRM mechs and the skills you need to be a successful pilot. LRM's aren't meta, LRM' aren't very popular these days but what I really hate is the fact that so called "competitive" units are disdaining LRM pilots. I have had endless discussions about that topic but the only way to silence them is to be successful, to be competitive. And it's not that hard, there are several ways to drive LRM-Boats successfully as you can read above. Have fun with this guide, I worked on it for a long time and I created it during the last week. Hopefully there will be some proof-reading later. Comments and additions are welcome. Feel free to post videos, pictures and texts - if they are useful, I will add them to my previous posts. Edited by Catalina Steiner, 02 May 2015 - 07:31 AM. Not to detract from the thread, but I disagree about LRM boating being the only perceived way of using LRMs. Boating does have it's place within the game, but I find that boating LRMs is asking for trouble. I've created many mixed weapon platforms, and they have worked very well for me. From my Stalker 3F, to my Battlemaster 1G. My Griffin 3M, Hunchback 4J (and 4SP) and even Raven 4X (and 3L). All these builds have worked very well for me, and many of them have some of my best stats on them (such as the Stalker 3F). There are strengths to boating, and there are weaknesses to it as well. I'm saying nothing against boating as a general principal; I'm just advising that there are other ways to create loadouts that can have a more balanced approach that can still work very effectively in the game. I discuss my balanced mech loadouts in more depth in my own guide, so as to not detract this guide with my own principals any farther. Thanks for your feedback, Tesunie. You are one of the few who got credits in my thread. Thanks for your work! Command console: Please explain this to me and to the other readers, please. Because Smurfy writes that it increases sensor range, zoon and it speeds up targeting data. Maybe we can lift this secret here. Command Console does improve sensor ranges which are helpful to LRMs to some degree. Zoom is decent for long range direct fire weapons. But many people think speeds up targeting data means it speeds up missile locks. Unless I have been misinformed (which I always leave as a possibility), this should mean that Command Console only makes the target's data (paperdoll) appear faster. This is similar to BAP's speed up of information gathering (which is the same as targeting data). Oh, and I noticed the nod in your credits to me. Thanks. Very well written guide, and certainly useful if you plan to run LRM's. That said, they are still subpar. Even with the best will in the world and ALL your time spent in LRM boats, you will be less effective than a direct fire mech. There are just too many counters. Other than lights, I counted 5 or 6 direct fire mechs on the enemy team. The rest were lurms. 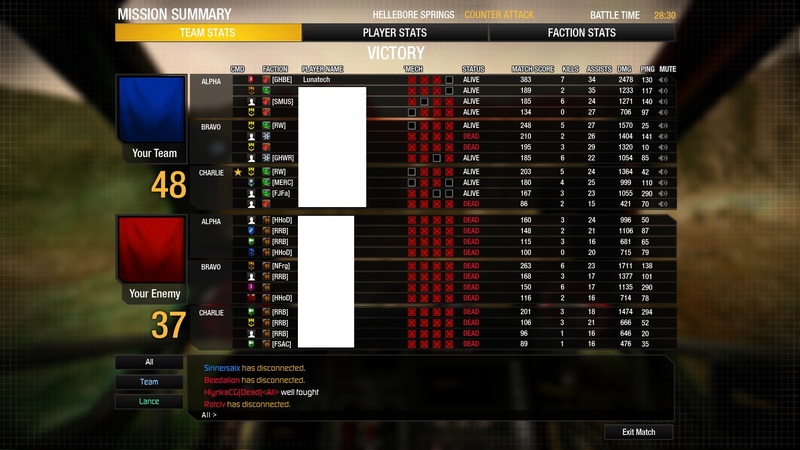 We had ECM, radar derp and cover. As you can see, that caused 7 or the enemy players to score less than 1000 damage over four mechs. As a 12 man against pugs. Even with the NARC raven they had. Not trying to detract from your guide, Catalina. It's highly informative and covers everything you need to know about running LRM's, and then some. I feel you really did hit the nail on the head when you mentioned that they are support weapons. In a typical match, one or two LRM mediums (I disdain the use of assault LRM boats that refuse to use their armour to support the team) providing added pressure to already engaged targets is a great help. But you absolutely cannot base an entire team around them. That will fail, massively. i don't LRM much anymore, but as someone who played 1000+ straight games perfecting LRM usage i can say if you put your time in and learn them inside and out LRMs are much more effective than 99% of players will ever lead you to believe. by the way, the rocket bending - BRILLIANT! never caught on you could do that so it's something i can use when i take the 1S out for a spin here and there for old times sakes. overall nice work! Edited by JagdFlanker, 02 May 2015 - 04:49 PM. As a 12 man against pugs. If you look, they don't seem to be a 12 man. At least if they are, they are not all from the same unit. I see a possible 6 man, 3 man, and 3 PUGs. I also see clan vs IS, which means different weapon mechanics overall. I've had matches in CW where I did ~600 damage. It does happen. If the enemy team is concentrating their fire, and yours isn't, well... I actually had one CW match (where I did the ~600 damage total that I can specifically recall) where the enemy team specifically head hunted me and killed me (which they then spent time shouting in chat that they killed me). I feel you really did hit the nail on the head when you mentioned that they are support weapons. In a typical match, one or two LRM mediums (I disdain the use of assault LRM boats that refuse to use their armour to support the team) providing added pressure to already engaged targets is a great help. As far as Assaults with LRMs, that one will depend upon the build and how it's used. As I tend not to boat LRMs, my Assaults end up using plenty of their armor. However, LRM assaults do have their own advantages to a team and can still be capable of using their armor to soak some hits for the team even. This one comes down to how they are played I feel. For the typical person's play style (something I call "Spray and Pray") in an LRM boating assault, yes I agree with you. Spray and Pray: This is where one depends solely on the locks of teammates and fire indirectly and indiscriminately. Though it can be effective, it is often not seen as the best option for LRM usage and isn't always effective (particularly in ammo consumption). BAP also cancels nearby ECM, so you can maintain locks at farther targets. Can be helpful when you have an ECM mech (light) dancing nearby or on top of you and you have a different target farther away for your LRMs. Not saying it's a must have, just saying that it does have a very decent place on an LRM mech. I personally forgo it on many of my LRM mechs myself, as I have other weapons to deal with the nearby ECM mechs (or I'll have it there for my SSRMs on the same mech). This is primarily for taste and preference. If you find it useful, use it. If you don't, then don't use it. It isn't a "must have". I actually found in my own testing* (using the same exact build basically) that the Stalker 3F appears to be a better chassis than the 1S. At least for myself. I wouldn't call it the best assault LRM boat, but it is on the list of the really good ones. I always found the better twist rate on the 3F (it's about the same as the 1S twist and arm rates) comes in more handy, plus it also means you can keep your torso mounted lasers on target better than the 1S, as the arms are the only weapons with that swing on the 1S. I also felt that the hit boxes on the Stalker are better. This could, of course, be a preference/skill thing instead. My overall stats for the same number of games informed me that the Stalker was a better ride for me (plus I enjoy my Stalker more and I play what is fun). *Testing was done before quirks. Things might have changed now since the quirks. Sorry Catalina if it seems like I'm over posting in here. This is a very dear subject for me is all. I do love my LRMs. Every artemis-equipped launcher sacrifices a ton of ammo for increased direct-fire accuracy. So I think the real question is do you want your damage dealt faster, or do you want increased damage potential. If you don't mind having increased damage potential over an extended period, I suggest ignoring artemis. I would not be surprised if the extra number of missiles that hit w/ artemis support per launcher is less than the number of missiles that hit w/o artemis support from an extra ton of ammo.